Pushkin Literature announces itself with no subtlety whatsoever. There’s a good chance you’ve seen it from the outside already: A colossal, kelly-green light-up sign stretching upward the length of two stories along the outer wall of Gongti’s Yoolee Plaza, featuring a larger-than-life depiction of Alexander Sergeyevich Pushkin himself. You’d think, given the size of the ad and the prominence of the author’s face, that Pushkin has some hot new release to advertise. That is, until you remember that he died in Saint Petersburg in 1837 in a duel. But if the sign tells you one thing, it’s that the theme of Pushkin Literature is 19th-century Russian, and the restaurant clings to this theme like a dollop of sour cream to the filmlike surface of borsch. We are surprised, then, upon entering, that Pushkin Literature executes this theme without a hint of gaudiness. OK, it’s not restrained – but overall, we’re impressed at the space’s ability to transport us far away from the bowels of Gongti. Plush chair cushions, bookshelves and frilly drapes lend it the air of an old-timey salon, or at least a movie set for one – the black ceiling with exposed industrial piping occasionally breaks the fourth, er, wall. A genuinely impressive pianist plays classical tunes as we eat, and high chairs line a dark wooden bar that acts as the stolid centerpiece of the whole room. We’d say it feels like 19th-century Saint Petersburg, but we’ve never been to Saint Petersburg, much less during the 19th century. So take that with a grain of salt. Food here sticks mainly to classics – but also pizzas, bizarrely. We stuck with Russian, however, and found the Moscow Salad (RMB28) the tastiest mash of potato and egg we’ve found in the city yet. 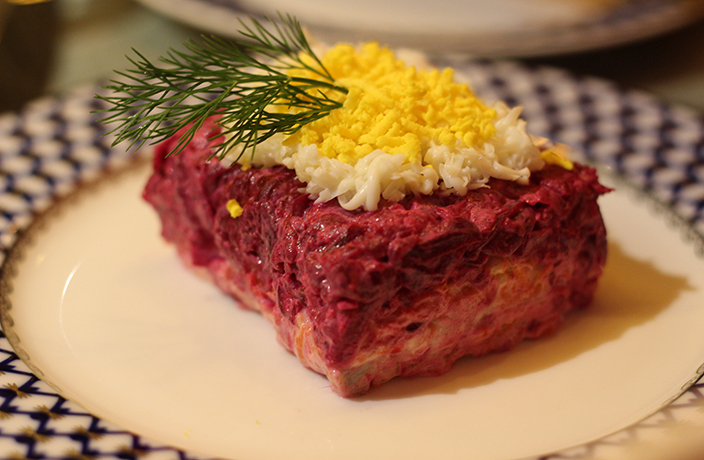 The Russian dressed herring salad (RMB48) did not fare as well – look, you have to be really into herring to like it – but everything else we sampled was delightful. Blinis here are hearty and come in several varieties (we enjoy the ham and cheese, RMB28), and you can even order small breaded pies for a mere RMB5 a pop (try the mushroom-potato). Borsch is a must in the winter (RMB58 for a single-serving bowl, RMB98 for family style). But don’t let it engulf your appetite before your mains arrive. Entrees here are hearty, satisfying and generally fairly priced. Our chicken Kiev (RMB48) comes on top of a heaping pile of creamy mashed potatoes, as do our Kremlin chicken meatballs (RMB58). This is a gluten-heavy menu, best washed down with liquid gluten, and by that we mean the Russian ales on offer served in beautiful crystal steins. You’ll remember you’re in China after you drink a few, and have to trek into the mall to use the bathroom. But until then, you may just forget where you are. And in this corner of Gongti, we reckon that’s a very good thing. A lowdown of this year's best new openings in the capital.